When I was younger I remember making this candy cane wreath with the family and thinking that it was the coolest thing ever! We wrapped a wreath form in ivory ribbon and then hot glued a bunch of those mini candy canes all around it. Vicki has always done crafts around the house ever since I could remember, and even years later I still remember that fun wreath we all did together! This year we decided to make our very own wreaths again. I had a couple floral stems I wanted to use in mind but needed something else to go with them. So Vicki and I ran to Hobby Lobby to see what would speak to us! I knew I wanted to use a grapevine wreath form again since I previously used one for my Fall Sweater Pumpkin Wreath and really loved it. 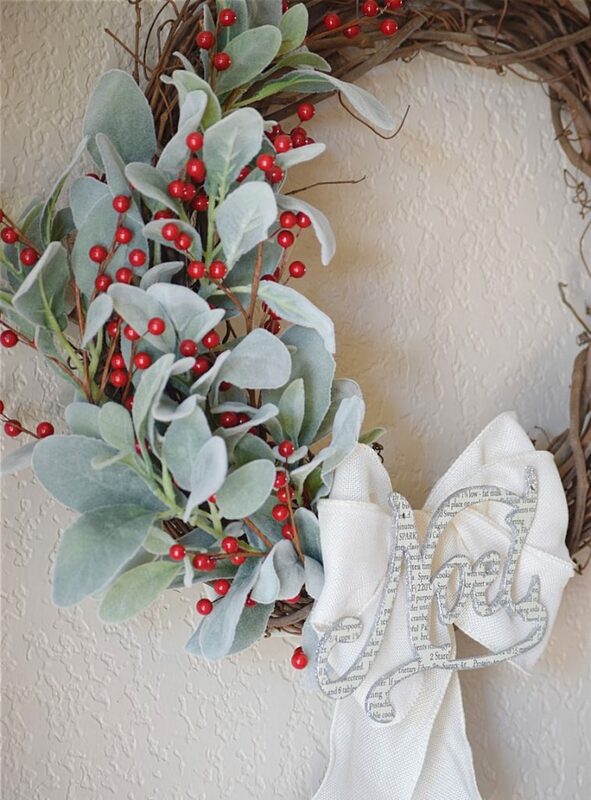 My idea was to use lambs ear and red berries together, but wasn’t sure how I wanted to put them on the wreath. 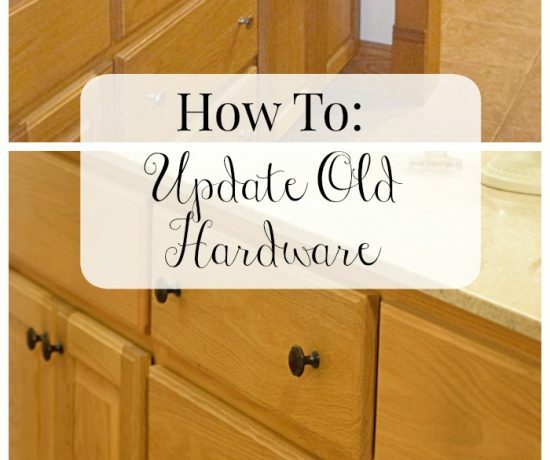 For your convenience in locating products we have used, this article contains affiliate links. If you make a purchase after clicking an affiliate link, we will earn a small commission at no additional cost to you. To see our full disclosure go to our “Disclosures” page. With my lambs ear, berries and wreath in the cart we then just went browsing through the Christmas aisles to get some inspiration! We found that beautiful ‘Noel’ sign as well and snatched it. We began by cutting the lambs ear stems shorter so they would tuck easier (you will need a wire cutter for this). Then begin tucking it into the grapevine on one side. I didn’t glue anything since they stayed nicely just by tucking. 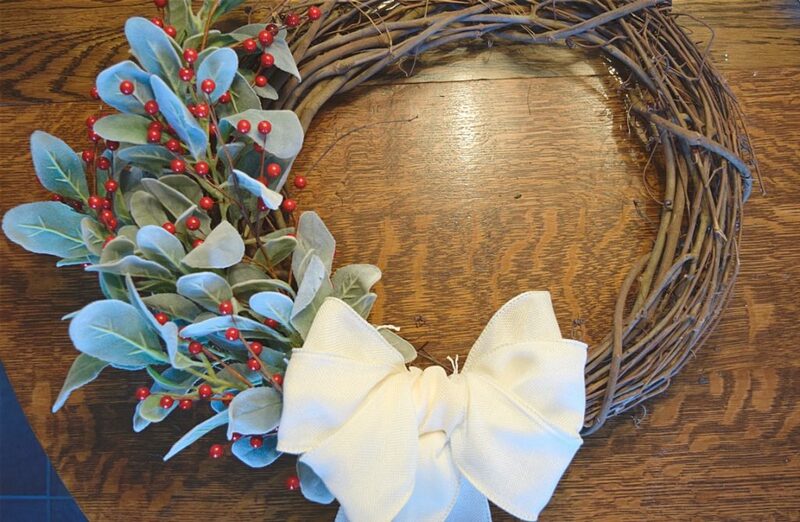 After the lambs ear was tucked on the side of the wreath I began adding the red berries. Starting from the bottom, I integrated the berries by again tucking into the wreath form. I pulled some lambs ear leaves around the berries so they were intertwined and more natural looking. Next we decided to make a beautiful bow out of ivory ribbon. This was something Vicki already had on hand. 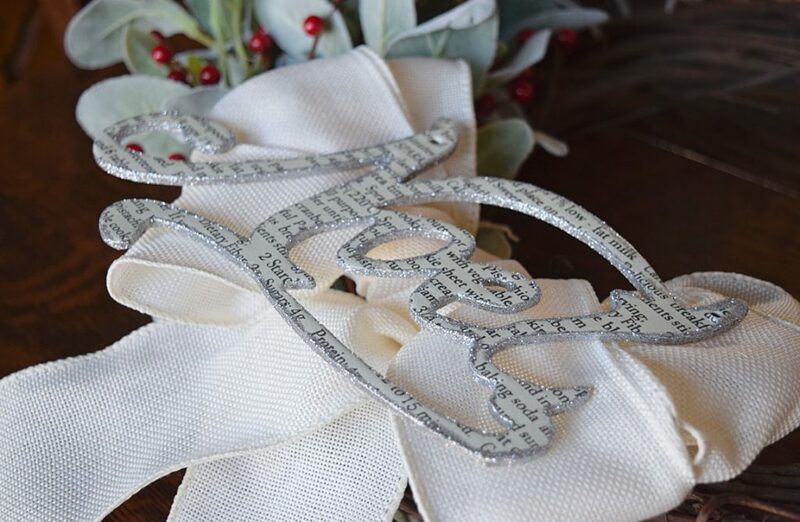 And to top the wreath off-the pretty book page and glitter ‘Noel’ was hot glued on top of the ribbon! Oh I am so thrilled with this wreath! 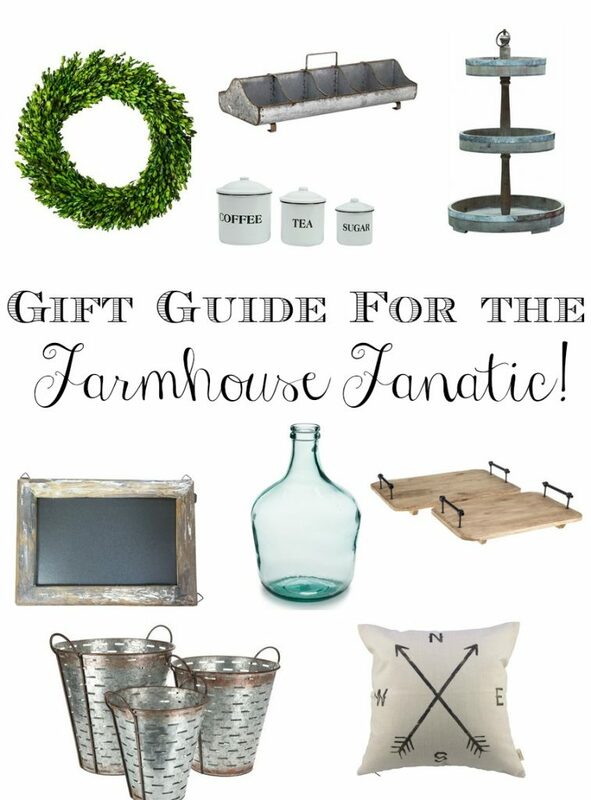 It matches perfectly with my farmhouse style of decor I have in my rental. 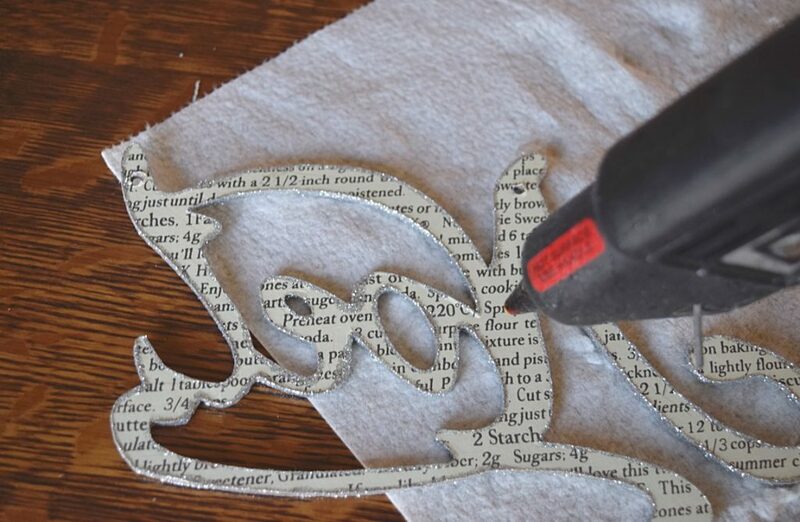 It was also very simple and easy to make, if you can cut and tuck then you can do this! 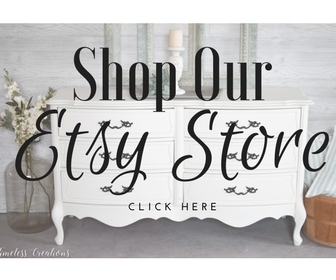 I love the texture and frostiness of the lambs ear, and the neutralness of the ivory and Noel piece. Yet that pop of red berries fits in with the rest of my Christmas decor. 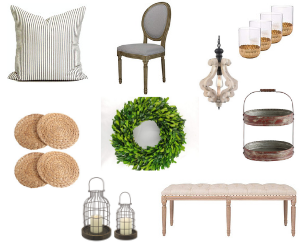 I like to have red for the holiday season, but I pair it with neutral champagnes, whites and browns. All links coincide with the pictures above! 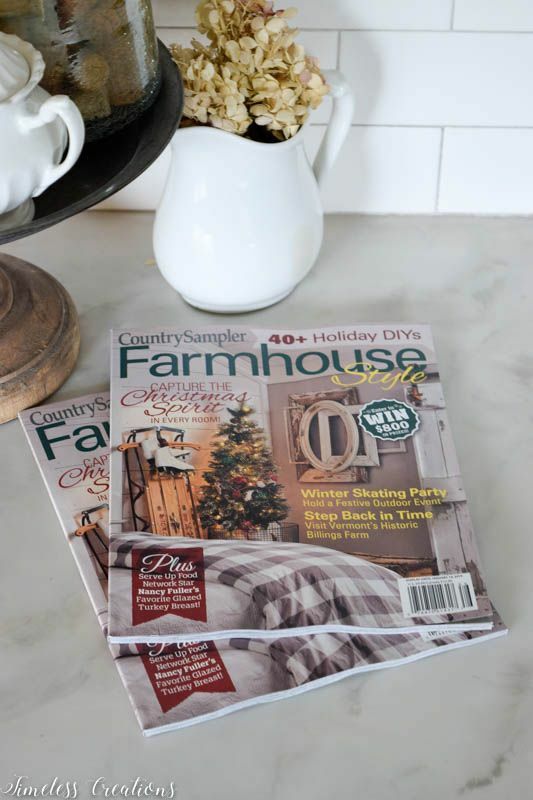 See our Wreath featured in Country Sampler’s Farmhouse Style Holiday Edition HERE. I love the frosted look of the lambs ear, perfect for wnter! 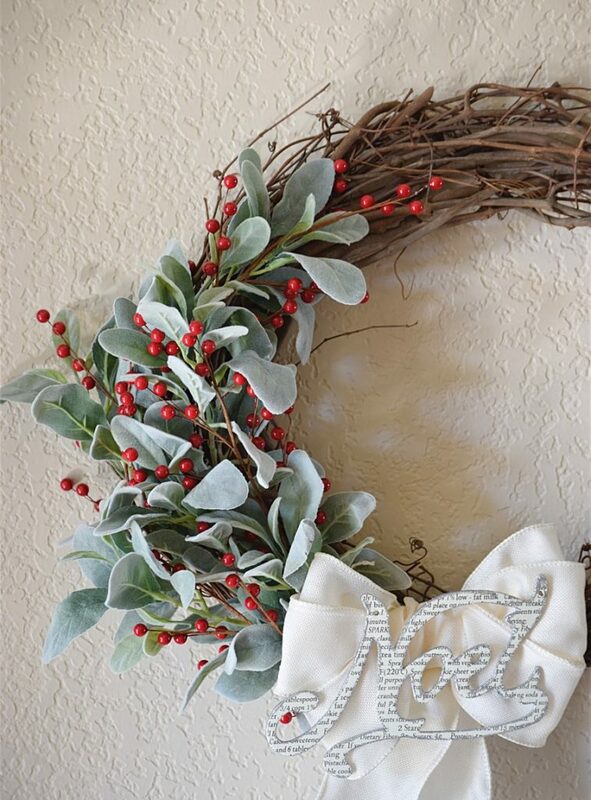 this is a great wreath, and it looks perfect in your home! Thank you so much Ariel! I love the color the lambs ear gives too and think it’s perfect for winter time! 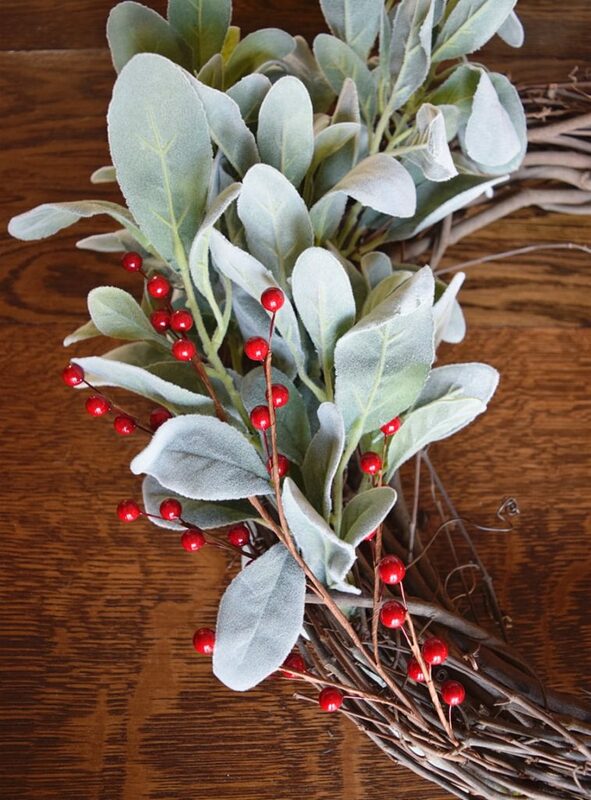 I really love the lambs ear with the red berries. What a beautiful combination! Thanks Kelli! We love the look they gave too! Such sweet memories, and a lovely wreath. The lamb’s ear is so pretty! I really love the greenery you used. This is so pretty and easy to recreate. Love it! Thank you Jessica! We are so happy with how the lambs ear and red berries turned out! Your wreath turned out beautifully!!! 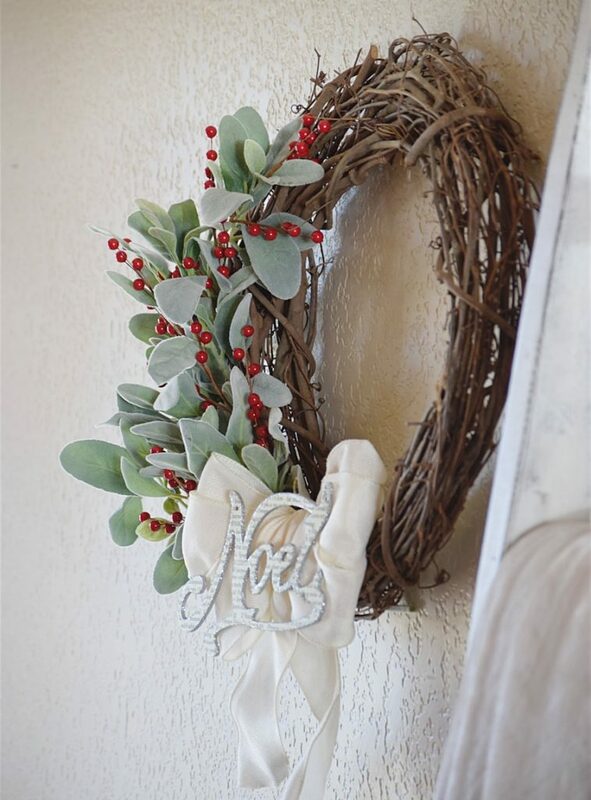 I always love a grapevine wreath and used them for my holiday wreaths as well!! Thank you so much Tammy! 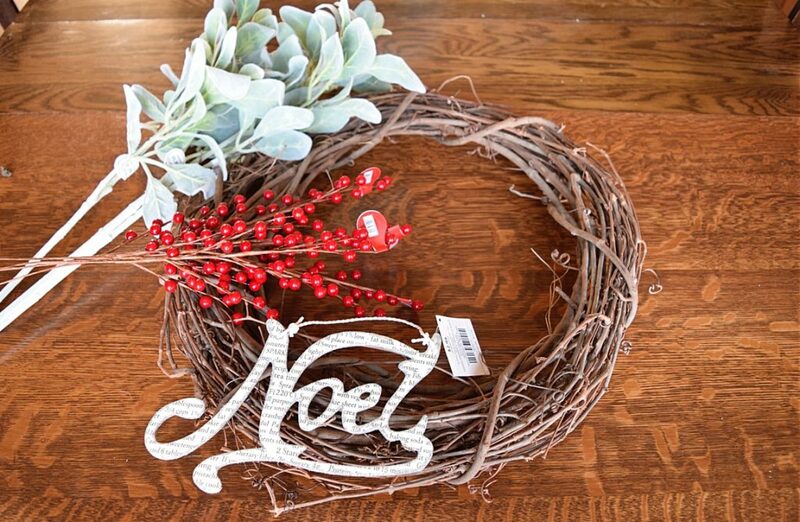 Agreed- love the grapevine wreaths! 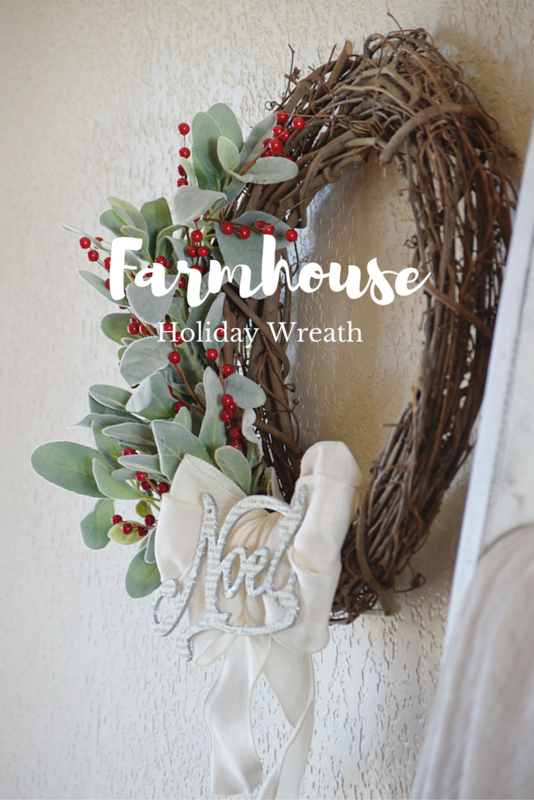 Your wreath turned out lovely-the farmhouse style is so pretty! 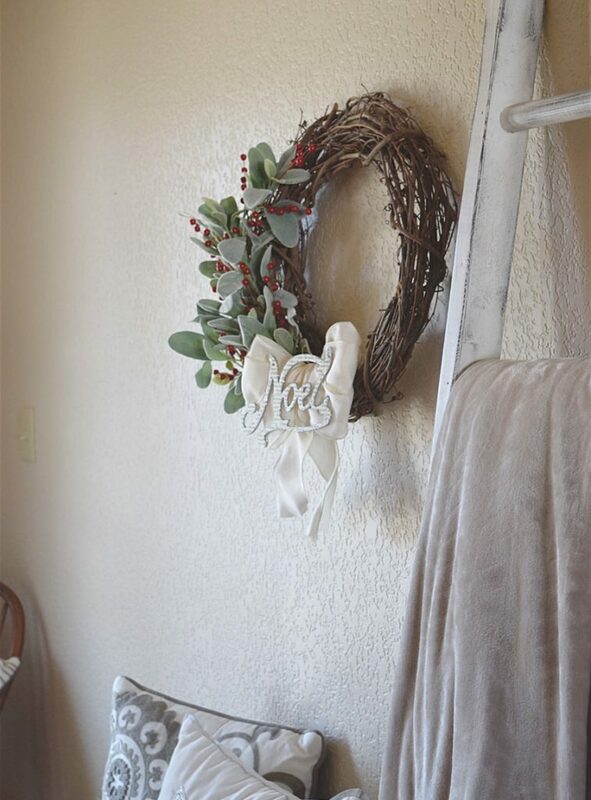 Kirsten and Vicki…that wreath looks just perfect next to your ladder. It’s simple and fresh and really just lovely and…that lamb’s ear! 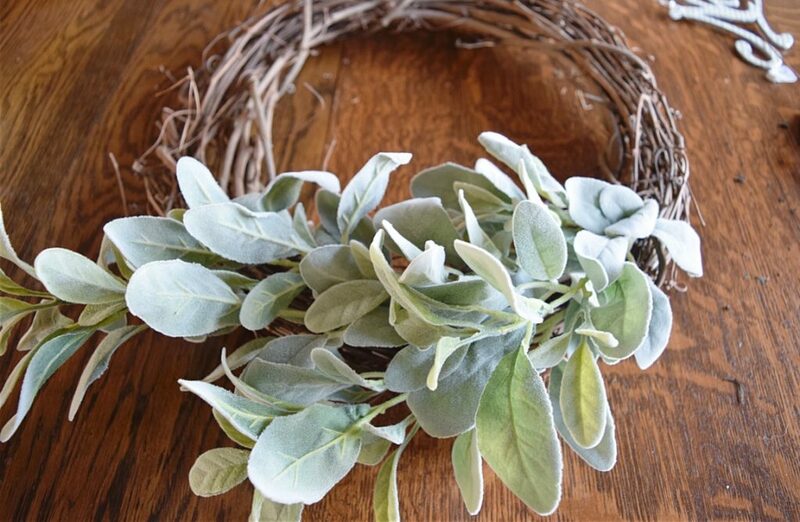 Such a unique plant and really adds something to your wreath.. Making wreaths clearly is a sign that the holidays are fast approaching, isn’t it! Thank you so much Lynn, we can’t believe how quickly the holidays always sneak up on us, they will be here before we know it! I love the colors and textures you chose for this. Beautiful! Love it. 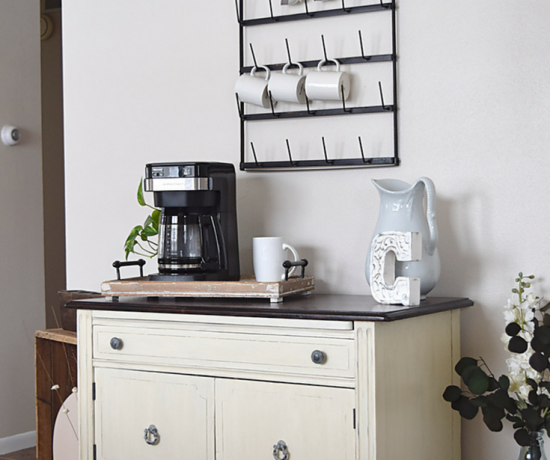 Thank you for sharing with us at #HomeMattersParty .We would love to see you again next week. This wreath is so beautiful. You have talent! 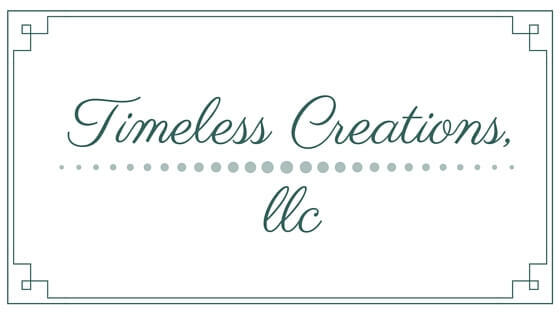 Thank you for sharing it at The Crafty Corner link party, where I plan to feature it at the next party (this Wednesday at 6 am EST). 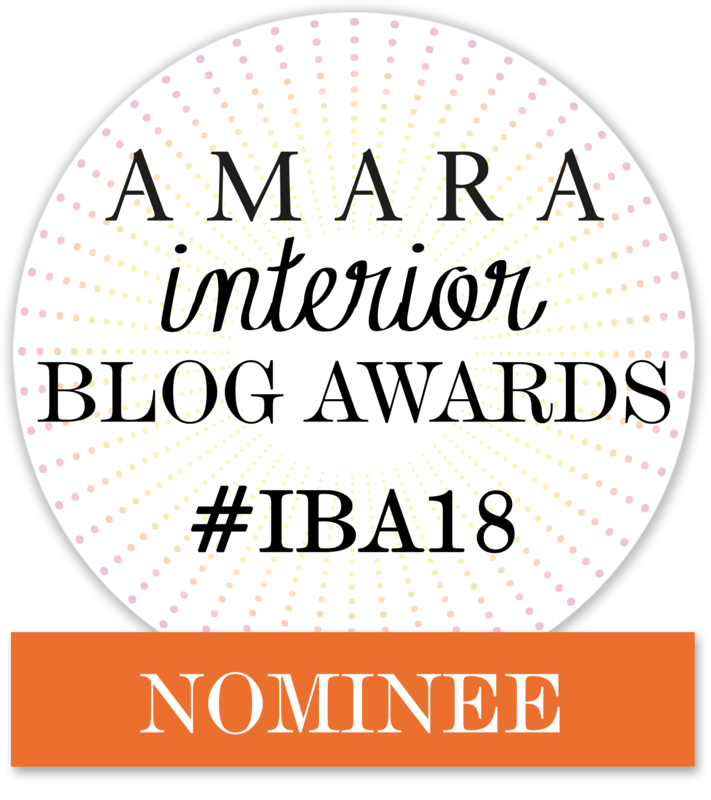 Oh thank you so much for the feature Antonella! It’s so pretty! I love the combination of the lambs ear and berries! Great job! This is so beautiful! I love the combo of lambsear and berries! Thank you! Oh we love that combo as well! The lamb’s ear is unexpected with the berries but it’s so beautiful. Gorgeous. 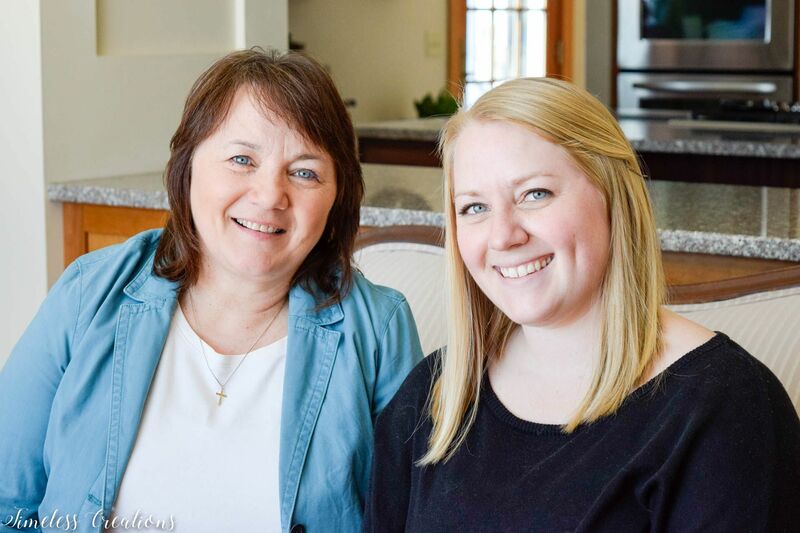 This wreath is beautiful my fav mom and daughter blogging duo! I would love to feature this later on in a Christmas post. It will be pinned to Thursday Favorite Things group board and also on my personal DIY Wreath Board too. Thank you for sharing with us again on Thursday Favorite Things. Oh Thank you so much Olivia for pinning and sharing later! We appreciate all your support! Beautiful wreath!! Love everything about it! Oh thank you Sara! It was so easy and fun to make! Such a beautiful wreath Ladies. I especially like the book page Noel that was added at the end, it adds such a special touch. Thank you Mary! 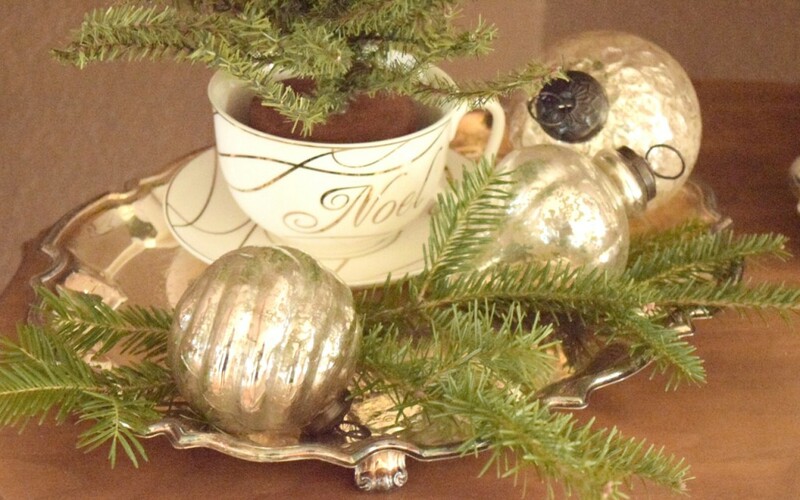 That ‘Noel’ does add a special touch-we agree! Thanks so much for linking up with us last week! 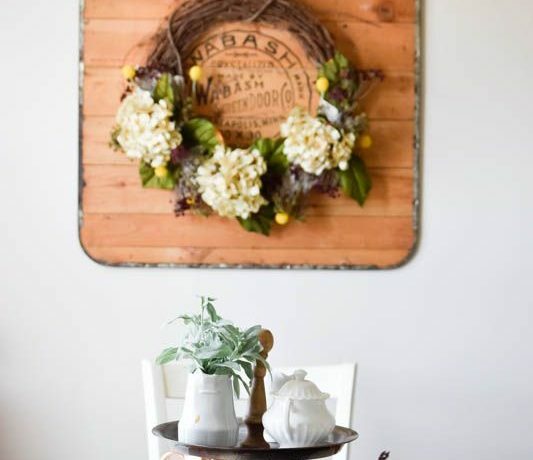 I’m featuring this pretty wreath tonight at our Best of the Weekend party! Have a great weekend. This is just beautiful. 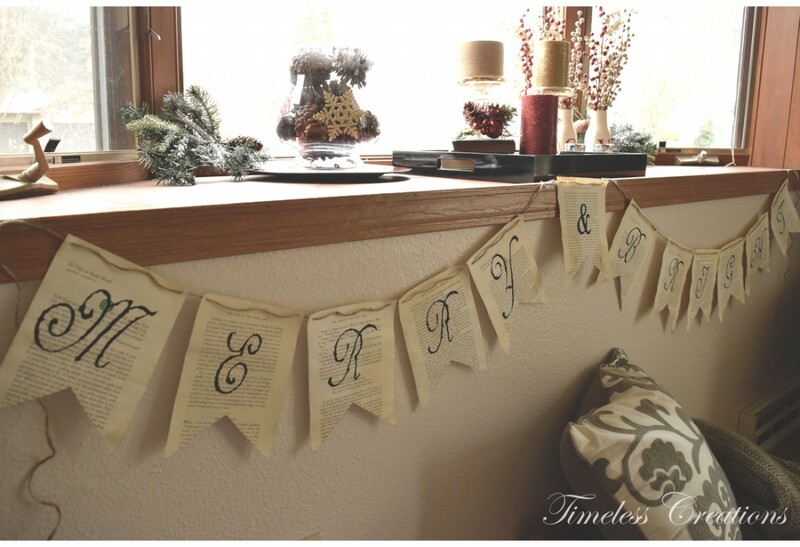 Pinning to my Christmas board! Very pretty! Thanks for sharing with us at the Totally Terrific Tuesday Party! I have pinned this to our group board. We would love to see you back again this week! Thank you so much for sharing Nicki! Thank you so much Jennifer! We appreciate the feature!